Kellogg's Raisin Bran® Cereal. Heart healthy. Excellent source of fiber. Delicious raisins perfectly balanced with crisp, toasted bran flakes. 9g Protein. Made with real fruit. Per 1 cup serving: 190 Calories. 0g Sat fat, 0% DV. 210mg Sodium, 9% DV. 18g Sugars. Net Wt 18.7 oz (1 lb 2.7 oz) (530 g). Great taste that does your heart good*. 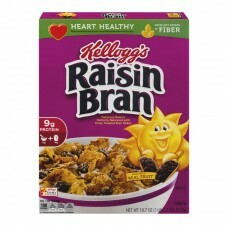 Enjoy the classic, delicious taste of Kellogg's Raisin Bran® and you'll smile your way through the day. Heart healthy*: Whole grains can help support a heart-healthy* lifestyle. Fiber, like bran fiber, plays a very important part in your digestive health and overall well-being. Real fruit: Delicious raisins add a sweetness you'll love to every morning. Two scoops!® Produced with genetic engineering. Try them all! Kellogg's Raisin Bran® Cranberries. Kellogg's Raisin Bran® Crunch. Whole grain - 27g or more per serving. Eat 48g or more of whole grains daily. *While many factors affect heart disease, diets low in saturated fat and cholesterol may reduce the risk of heart disease. Please recycle. Certified 100% Recycled Paperboard®™. how2recycle.info. ®, TM Kellogg NA Co. Questions or Comments? Provide production code on package. Call: 1-800-962-1413. Visit: www.kelloggs.com. © 2015 Kellogg NA Co.